KENTWOOD March 25, 2015– Kent-Ionia Labor sponsored its first Feeding America food truck of 2015 last week, partnering with St. Mary Magdalen Parish in Kentwood to deliver 5,000 pounds of produce and baked goods to more than 350 individuals in 99 households. 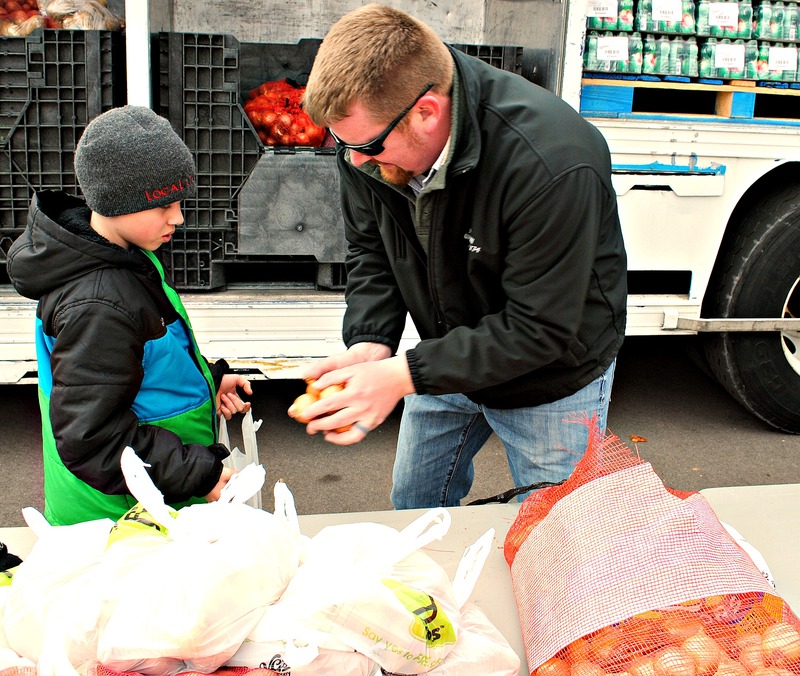 Kent-Ionia Labor Council Vice President Nathan Phillips (UA 174) loads produce with his son at the March food truck. Here’s how the food trucks work: Members and retirees of west Michigan labor unions donate their time and money every month to deliver a Feeding America mobile food pantry– or food truck– to a church or service organization in the Grand Rapids area. Church staff and volunteers then get the word out to their congregants and neighbors, making sure anyone who needs a little extra help knows the time and place they can pick up their food. The food is distributed to anyone that shows up, with no proof of income or need required. Last year, the Kent-Ionia Labor Council, the Heart of West Michigan United Way, its partner organizations and volunteers delivered over 64,000 pounds of food to neighbors in need. Next month’s food truck will take place on April 16 at City Life Church, 574 Division Avenue South, Grand Rapids. This entry was posted on March 25, 2015 by WMALC in Community service news and tagged church, Feeding America, Grand Rapids, Kentwood, UA.